DSLRs and other interchangeable‑lens still cameras offer film‑like footage at entry‑level prices. 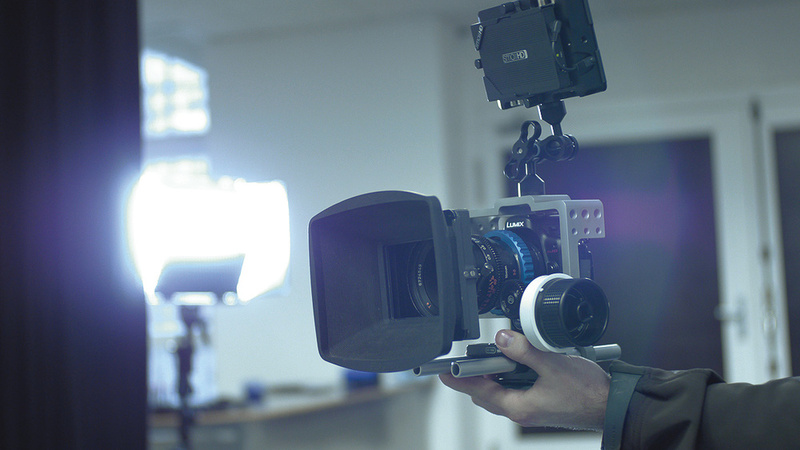 Our introductory guide to cinematography will help you to get the best from your camera. When you watch a well‑crafted film or music video, you're absorbed by a mood and a story. Many film-making techniques will have been used to help tell that story and build that mood, and collectively we call them cinematography. A combination of craft, know‑how and art, cinematography is about maximising the things our eyes find most pleasing and putting feeling into images, while at the same time minimising what we find ugly or unnatural. Having said this, sometimes the exact opposite can be true, depending on the film! Cinematography helps to strengthen a story or express an idea; it creates as much of a link between an idea on screen and the emotional reaction in the viewer as music and dialogue do. Good cinematography is not just about 'eye‑candy', but about giving substance and meaning to what's on screen, using technology, skill and artistic expression. It's not even just about careful framing and high production values: matching up 'moods' and 'feels' is arguably even more important. DSLR stands for 'Digital Single Lens Reflex', and the 'Reflex' part refers to cameras that use a mirror for their viewfinder. (In reality, there are plenty of mirrorless still‑image cameras with changeable lenses that can shoot HD video, such as Sony's NEX mirrorless system and the mirrorless Micro Four‑Thirds standard.) To keep things neat, I'll refer to all of the modern video‑capable still cameras as DSLRs, because the acronym describes well the difference between these cameras and camcorders. Popular DSLRs include Canon's EOS 5D Mkii, 550DRebel T2i, 600DRebel T3i, 60D and 7D, as well as Nikon's D7000. Mirrorless Micro Four-Thirds cameras that are used by cinematographers include Panasonic's Lumix GH1 and GH2. These cameras are easily obtainable, being sold in mainstream consumer electronics stores, which means that artists wanting to express their vision can now do so with a relatively inexpensive tool that rivals the aesthetic of the classic medium of cinema. Architectural line and natural elements can combine to create pleasing imagery.One of the core aspects of cinematography that makes for a memorable music video or film is the location. Some locations lend themselves better to a video than others. Some have hidden depths and provide interesting cutaways (shots of anything other than the main subject, used to maintain interest in an edit). DSLRs benefit from being highly portable, opening up many locations that would have been impractical with other cameras. The key to choosing locations is to tailor your ideas to work with places that you can access, and those that allow you to be visually imaginative in your approach. Some privately owned locations are extremely expensive to use, so it's a good idea to get to know some local business owners and ask if they're open to a bit of filming on a quiet day. The smaller the privately owned location is, the easier it will be to get an answer one way or another, because you'll often be talking directly with the owner or manager, rather than someone without the direct power to push things through. DSLRs also open up the possibility of guerilla filming techniques; quick shots taken on the spur of the moment. The locations you can practically make use of will affect the scope of your idea, so play with those limitations and use them to your advantage. The 'rule of thirds' refers to a system where the image is broken down into a 3x3 grid, with points of interest placed near the lines.Whatever kind of camera you're using, framing a shot is as much about removing things as it is about adding. A minimalist approach is often powerful and direct. The first thing to do is identify what you want the shot to say, and the atmosphere you want to get across to the viewer. Work out what the key elements in the shot are, then remove things that distract a viewer's eye. Look at the geometry of the shot; perhaps some architecture, a natural element or the location in general. What feeling does it give you from different angles? If you use architecture to box off your scene, it may feel more claustrophobic than if you leave one side of the shot open, for example. Next, think about the placement of actors or objects in the scene, how the light is cast and what kind of lens — wide angle for landscape, telephoto for a portrait shot, or macro for close-up, for example — is best suited to capture what you like about the scene. When framing shots, it helps to have a good visual imagination and artistic voice to influence where you put the camera, and you can learn a lot by studying films. Some cinematic conventions come from a natural human reaction to certain types of positioning. For example, if you place a close up of a character's face on the left-hand side of a shot, facing left, viewers will naturally assume that something is going to come up behind them! It feels very tense. Place the same close-up on the right-hand side looking left and the scene immediately becomes more relaxed. Here, 'dead space' or 'negative space' (highlighted) is used to enhance the loneliness of the character.The 'rule of thirds' is a rule of thumb for stills photographers, but it works for video too. It states that the main features of a scene, such as an actor's eyes, should be placed along two horizontal and two vertical lines, dividing the frame into nine blocks. This seems to tap into the fundamental nature of how we judge the aesthetics of an image. Not every shot must be framed using this rule. You don't become a better cinematographer by using rules alone to compose a shot, but it helps to be aware of them, and to subvert or break them when it benefits the scene. For example, a symmetrical frame — with points of interest in the centre of the image — is often more dramatic and intense than a frame composed using the rule of thirds. A character's motivations and feelings should affect the composition of a shot. This simple diagram shows the relative sensor sizes of popular cameras. 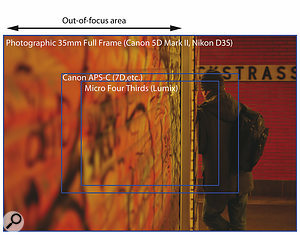 We can see that larger sensors show more of the out of focus area, leading to a shallower depth of field. 'Dead space' or 'negative space' (an empty part of the scene) is critical to creating emotion through cinematography, and is part of the language of cinema. 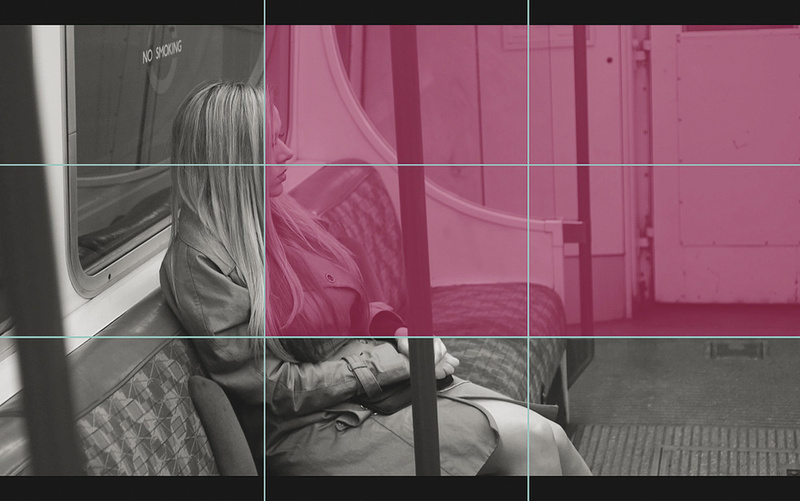 Using the rule of thirds, the character in the image on page 196 is positioned with four blocks of dead space in her line of sight (highlighted in pink), giving a sense of loneliness — a blank stare into empty space. Similarly, you can make characters (or band, or soloist) look smaller or give them a sense of grandeur, just by how you place them in the frame relative to emptier areas of the image. Having your subjects fill the frame will feel very personal and help the viewer to empathise, while having them distant in a large amount of space will make them appear insignificant and lost. Using just one subject and one lens, it's quite possible to create many different emotions. This is a good way to practice composition: limit your equipment and just alter the subject and surroundings. Moving a DSLR while recording requires support gear, or 'rigging', of various types (see 'DSLR Support Gear' box). Rigging is any object or structure that supports the camera, be it a huge crane or a tiny handle! In the hand, a small and light DSLR will have a jittery movement, especially with longer (more 'zoomed in') lenses beyond 50mm. You can sometimes get away with handheld shots using very wide‑angle lenses, or with an optical stabiliser mode turned on using lenses that feature it. I find that optical stabilisation gives handheld camera‑work a strange, electronic, 'floaty' feel, so I prefer to use a shoulder rig (see 'DSLR Support Gear' box). One of the big advantages of DSLRs over other 'professional' video cameras is their small size. This means that support gear can be lighter, smaller and more flexible. For handheld footage, a shoulder mount with two handles to stabilise and aim the camera, along with rails that attach to a padded shoulder mount, can give footage a steady and natural look. 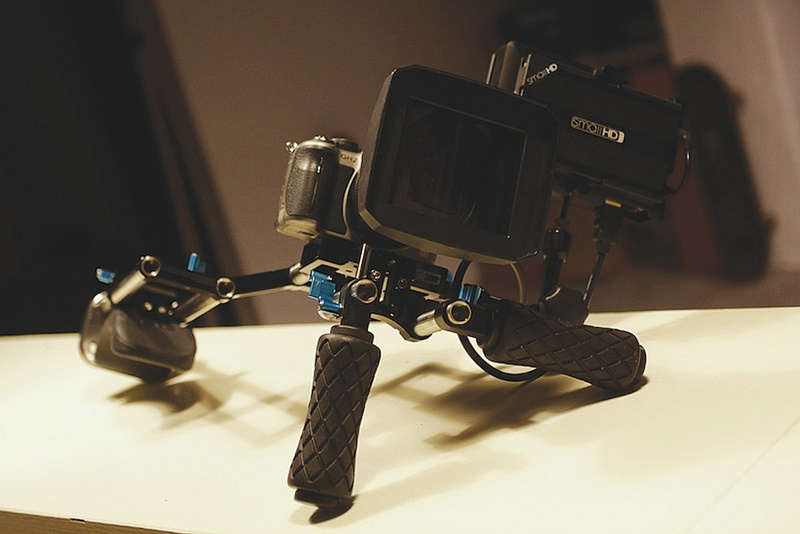 Without support gear, the movement of your hand, although it may feel very small, can dominate and ruin your footage. Don't use too much rigging, though, or you're starting to defeat part of the point of having a small, portable camera! Though it's often tempting to leave beautiful shots in an edit simply because they look nice, it's sometimes best to remove them and make the piece more focussed.While DSLR camera bodies become obsolete very quickly, generating a lot of excitement but being superseded, a good lens can be good for life. Lenses can almost always be adapted to future camera systems, and some of the best lenses I use today on DSLRs were made 30 years ago! The lens influences the look of DSLR footage more than the difference between having a Canon or Panasonic camera. Lenses can be as idiosyncratic as microphones, imparting different feels and characteristics to a recording. One important aspect of a lens to look out for is how 'fast' it is. Not its aerodynamic properties when thrown, but in terms of 'f‑stop'! The f‑stop is a measure of how much light is being projected into the camera by the lens. An f‑stop describes the width of the aperture — the iris of the lens that expands and contracts like the iris in the human eye. The smaller the aperture, the less light reaching the sensor and the higher the f‑stop number. Aperture does not just effect the brightness of the image and the light level you are able to work with. A faster lens (wider aperture, lower f‑stop) also captures a shallower depth of field, which can be used to great cinematic effect. At f8, the image will have a deep depth of field, rather than the dreamy, shallow depth of field DSLRs and film are known for. This can still be useful though, for shots such as landscapes. 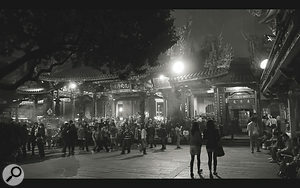 At the other end of the scale, at f1.2, the low-light performance of the camera is elevated almost to the point where it will see more than the human eye in a dark scene. The focus plane is also very narrow (a shallow depth of field). The Letus Talon K1 shoulder rig for DSLR.An aperture of f2 or faster is considered a 'fast lens', bright and shallow. A lens with a maximum aperture of f4 or upwards is considered a relatively slow lens, so is not as good for low‑light shooting and displays a deeper depth of field, making it harder to separate a subject from the background. Choosing a cinematic lens is not always about spending the most money and buying the most technically perfect. Some cheaper or older lenses have more 'character' than modern counterparts. Older lenses also usually have less advanced 'coatings', creating images with lower contrast, but enabling spectacular lens flaring. Some older lenses use mounts that only fit discontinued cameras from the '70s and '80s, but can easily be adapted to most modern DSLRs, using an inexpensive alloy adaptor available direct from eBay sellers in Hong Kong. 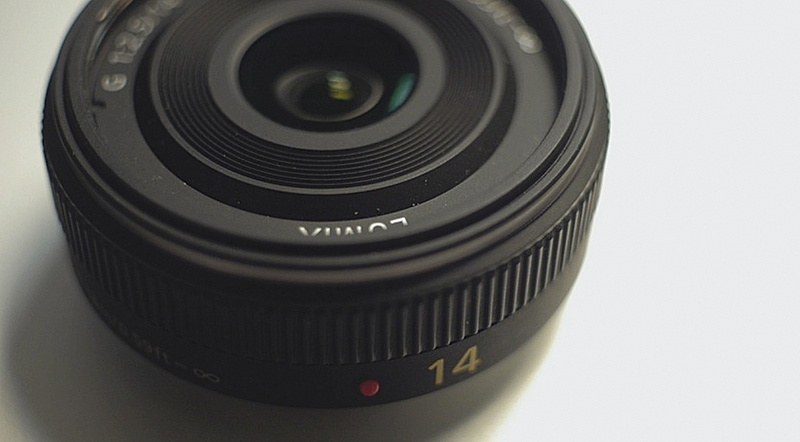 A good starting point is to get a range of prime lenses. Prime lenses are fixed to a specific focal length, and are often faster and sharper than a zoom lens of equivalent price, if less convenient. To cover the most useful cinematic framing styles, you will need 35mm, 50mm and 85mm lenses in 35mm (135 film) photography terms. A camera such as the Canon 5D Mark II is a 35mm (135 film-sized) format DSLR. On this camera, a 28mm lens would be a wide‑angle lens, capturing an image about 65 degrees in width, from the camera's point of view. The Canon EOS 550DRebel T2i has a 1.6x smaller APS‑C sensor (similar in size to motion-picture 35mm film). The sensor is not as large, and captures a smaller portion of the image circle projected by the lens. Therefore, the actual field of view of a 28mm lens is no longer as wide, and will be 1.6 times longer, or more 'zoomed in', capturing about 55 degrees of image from the camera's point of view. The three standard prime lengths needed to cover the aforementioned views using an APS-C camera are therefore around 21mm, 35mm and 50mm. 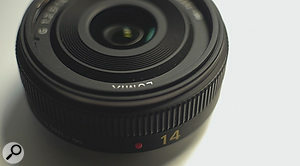 This 14mm lens is designed for a Micro Four‑Thirds camera, where it will show an image as wide as a 28mm lens on a full‑frame still-image camera such as the Canon EOS 5D MKii, due to the 2x smaller sensor. On a 2x crop camera (such as the Panasonic Lumix G series and Micro Four‑Thirds cameras), a 17mm lens will give you a 35mm field of view. 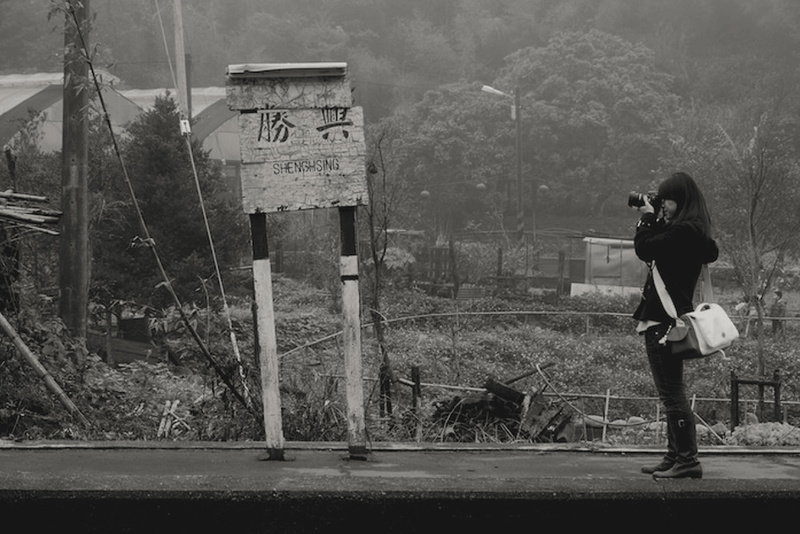 Notice that on a 2x crop camera you need yet wider lenses to achieve a wide field of view. 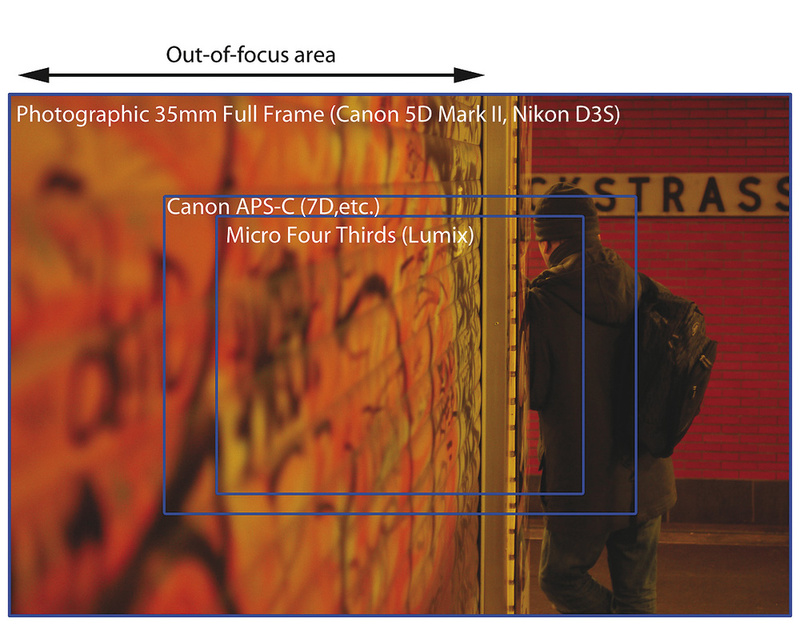 Most DSLRs do not have autofocus that's optimised for video, meaning that manual focus is a necessity. Keeping things in focus can be difficult, so when you're shooting, it helps to make the movement of actors or band members predictable, by asking them to move between marks on the floor. That way you'll know where to move the focus to at a given time. The DSLR shallow depth can be troublesome when focusing, and it's especially evident with the Canon EOS 5D Mkii DSLR, with its extra-large sensor. Unless you add a follow focus unit (see 'DSLR Support Gear' box), it can be hard to change the focal point accurately during a shot. If you're shooting a music video on a tight budget with minimal equipment, it could be best to try and avoid changing focus during a shot altogether, unless wandering focus really suits your piece. It's also good to have enough light available to shoot at 'slower' apertures, like f4. Here the deeper depth of field will mean that when there's a lot of movement, your subjects won't keep bobbing in and out of focus uncontrollably. Hollywood director James Cameron once said "Pick up a camera. Shoot something. No matter how small, no matter how cheesy, no matter whether your friends and your sister star in it. Put your name on it as director. Now you're a director.” Thanks to DSLRs, it's easier and less expensive to do this, and your first piece can look more like a cinematic creation than ever before. The most important thing is to get a camera in your hands and shoot some footage. So learn the rules, break a few more, experiment and make the films you've always wanted to! If you want to create a stable still shot or pleasing motion with a DSLR, you'll benefit from using 'rigging'. The rolling shutter or 'jello' effect created by the scanning style of the CMOS sensor can be very unattractive, so freehand shooting is usually out of the question. Odd filming locations are more accessible than ever before because of small DSLR cameras. Using minimal rigging lets you capture great footage in remote places with ease.This is a support rig that consists of rails running under the camera, attached using a quick‑release plate (like on a camera tripod), allowing the camera to be removed quickly if necessary. The image to the right is of a Letus Talon K1 rig. The camera sits on top of the rails, and a padded contact point is placed on the shooter's shoulder. There are one or two forward-facing handles, which the shooter holds to support the camera at the front and to point it at the desired angle. A slider or dolly is used for tracking shots. A dolly mounts the camera or tripod on a trolley, which rolls down rails and can be used for long and elaborate tracking shots. A slider is basically a small track that sits alone or on top of a tripod, and can be hand, crank or motor powered, for smaller glides. Motorised sliders allow precisely repeatable movement or smooth constant movement over a preset period of time. This opens up a few creative techniques such as time-lapse and high dynamic‑range shooting. Named after the pioneering manufacturer, a Steadicam system allows the camera to glide smoothly by dampening the movement of the shooter's arm, using balancing and pivoting mechanisms. If you intend to walk (or run) around a lot with a DSLR while recording, this is the best option. These systems do require practice to get the best footage. The most common camera rig of all is a tripod, used for 'locked down' or static shots, as well as panning shots where the tripod head rotates and tilts. It's best to buy a light but robust fluid‑head tripod. A good tripod is a great investment in your footage. DSLRs are light and do not need huge support legs, but it helps to have a steady and well-made tripod that doesn't drift when you lock position, or wobble in the wind. This is the most basic of rigs. It's a viewfinder that sits over the LCD screen and magnifies it. Some use a a base‑plate that screws into the camera to attach, while others use magnets and a metal rim positioned around the screen. This acts as a rig, since the viewfinder adds another stabilising contact point with the shooter's body, in this case their head. This is a control wheel at the side of the camera, used to adjust the focus of the lens manually. It saves you having to put your hand on the camera itself, which may unsteady the shot. The follow focus transfers rotation using gearing that straps around the camera lens, but you can purchase simpler follow focus systems that use a rubber band and a skateboard wheel. The standard frame-rate for 35mm film is 24 frames per second, which is not smooth‑looking, like TV news with its interlaced imagery. (When video moves too smoothly, we notice that it's video we're watching, not film.) Recording digital video at 24 progressively scanned frames per second, rather than 50 or 60 interlaced fields, emulates how film is projected as a series of pictures. Those living in countries using a 50Hz power system (such as the UK) can use a 25p recording mode to achieve compatibility with local television systems and still retain a film‑like look. Digital video from small‑sensor cameras often looks lifeless, with everything in focus at once, simply because the sensor area is too small to accommodate the out‑of‑focus areas of the image. Even if the focal plane is narrow, the sensor is so small that the in-focus part still occupies the whole frame, so the frame has everything in focus. A shallower depth of field is enabled by 35mm film (the Hollywood 'gold standard' for decades), so characters can be in focus while everything else around them falls out of focus into an attractive blur. Motion-picture 35mm film is about the same size as an APS‑C sensor, and a little smaller than a full‑frame photographic sensor, such as in the Canon EOS 5D MKii, so film-like depth of field is easy to achieve. One of the most important people on a movie set is the person who controls the focus of the camera, manually. 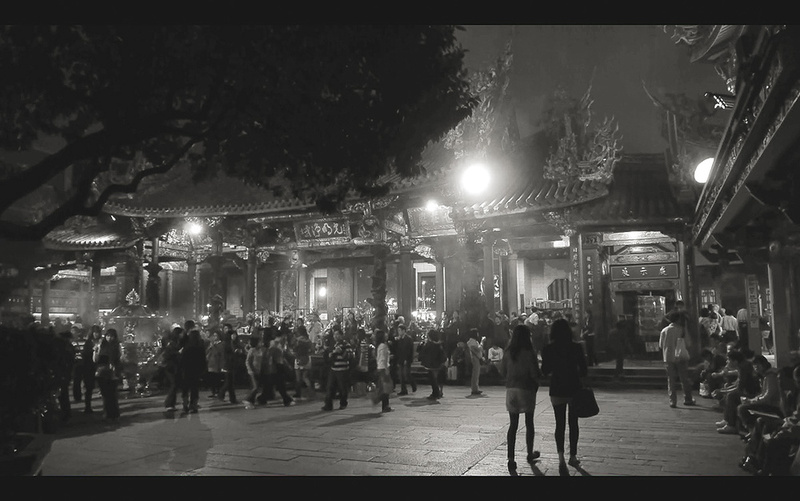 Unlike auto‑focus on digital video cameras, a human can breathe life into a scene. Focusing manually is something of an art, requiring physical practice. It is often slower, and certainly less perfect and more organic than autofocus. A person can understand a scene, the story, and what kind of focus suits a particular moment in a way that a processor cannot, and this often shows in the final piece. For shots where the focus should remain fixed on a certain point, having focus under control with a manual focus lens is much preferred to auto‑focus, since there is absolutely no chance of a sudden shift in focus ruining a shot. Low‑budget cinematographers can now use real locations and natural light, because DSLRs are so sensitive to even the most subtle illumination. I am a fan of this approach, not least because natural light is the most realistic of all. Getting the right time of day for outdoor shoots is essential. 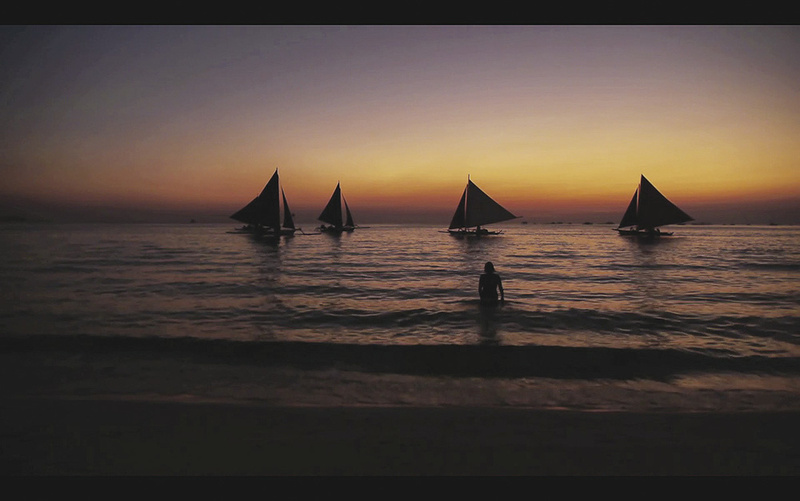 The most beautiful light is often extremely short‑lived, but it can massively influence the cinematic quality of a music video. 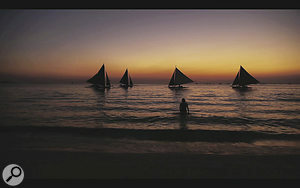 The time around sunrise and sunset is often called the golden hour, and can bring a dream-like feel to footage. Since the large sensor in a DSLR absorbs a lot of light, there are plenty of chances to get the shots you want, even in lighting conditions where other cameras may struggle.